Jane Beach, Martha Friendly, Carolyn Ferns, Nina Prabhu, Barry Forer. This comprehensive report, the 8th edition since 1992, provides key data on child care and kindergarten across Canada. It tracks spaces, finances, quality issues and public policy developments at the provincial/ territorial and federal levels, includes demographic information such as mothers' labour force participation, and identifies trends over time. Childcare Resource and Research Unit, September 2009 , 4pp. This companion document to ECEC in Canada 2008 highlights 30 important facts about Canadian child care, kindergarten and family leave. Available in pdf for download below. 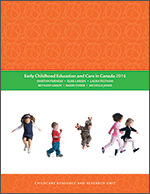 The full text of ECEC in Canada 2008 is available in pdf format from the links below. Although there is not one link for the entire book, the four downloads (SECTION 1 through 4 below) will give you the full text.